Just a few years ago, the trend in finer dining was to create ultraprecise “tweezer food,” as it came to be known—artistic (though arguably too fussy) dishes in which chefs used tweezers to meticulously place ingredients, such as each leaf of microgreen. Thankfully, the backlash from diners, food critics and some fun-loving chefs has resulted in more whimsical, playful food that is no less delicious—or less beautiful, for that matter. The perfect example of this is at Sawyer. Former Lark chef de cuisine Mitch Mayers opened the Ballard eatery in early August in the 4,700-square-foot space that formerly housed Kickin’ Boot (and long before that, a sawmill in the 1920s). Where that restaurant was dark and broody, Sawyer is bright, timeless and manages to feel intimate for a place that seats 115, thanks to a puzzle of little booths. 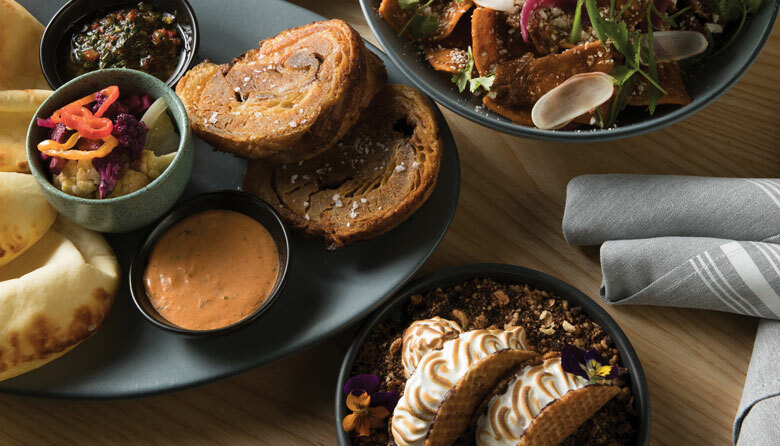 The key to getting the most out of a visit to Sawyer is to go with a big enough group that you get to try a little of everything on the menu; it’s a menu that taps into our collective nostalgia. Mayers’ version of “junk food” has a way of making us feel like kids again—kids with a (slightly) more refined palate and bigger bank account. Mayers is hoping this will become a neighborhood staple. I just wish I lived next door. MUST TRY: Although the choco tacos are excellent and shouldn’t be missed, also be sure to order Mayers’ version of a Dairy Queen Dilly Bar, which comes covered in a Theo dark chocolate magic shell and is presented stuck vertically in a bowl of cookie dough semifreddo ($4).